Finches are renowned as seed-eaters, able to use their beaks to crack even olive and cherry seeds. But can finches survive when seed is in short supply? That’s the situation faced by the sharp-beaked ground finch on tiny Wolf Island, about 200 km (120 miles) north of the main islands of the Galápagos Archipelago. For most of the year, this wave-pounded island of steep cliffs and tens of thousands of seabirds is tinder dry. Any seeds produced in the brief periods of rain are soon eaten by the finches—leaving them, you might think, facing starvation. However, film-makers have now documented how the finches turn for sustenance to the island’s nesting seabirds, in order to survive the extended dry periods.1 For example, opportunistically raiding the seabirds’ eggs. But it seems their primary source of food during drought is … blood! Did God make the ‘vampire finch’? The answer, of course, is that God did not make the finches to live in such a manner—originally, all animals/birds were vegetarian (Genesis 1:30). But after Adam sinned, death and bloodshed entered the world. 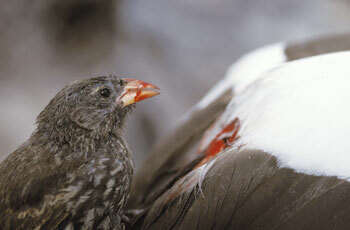 The Galápagos finches give us an insight into how some instances of carnivory may have arisen after the Fall, and also after the Flood.3 The first finches4 to arrive in the Galápagos Archipelago5 (probably from the Americas, as Charles Darwin surmised) were likely to have still been seed-eaters. But on islands where there was a shortage of seeds, some finches learned to use their beaks for other purposes, e.g. probing under bark for grubs.6 And on Wolf Island, the sharp-beaked ground finch discovered its sharp beak was useful for procuring itself a nutritious though gruesome ‘liquid lunch’. Kea: clever, clownish and … carnivorous!? ABC Natural History Unit—Islands of the vampire birds, Amazing finch behaviours, <www.abc.net.au/nature/vampire/finches.htm>, 4 August 2006. Return to text. In fact, sceptics frequently ‘ask’ that question publicly—maybe not desiring to seek an answer, but rather because they perceive it to be an unanswerable challenge to Christianity? See, e.g. 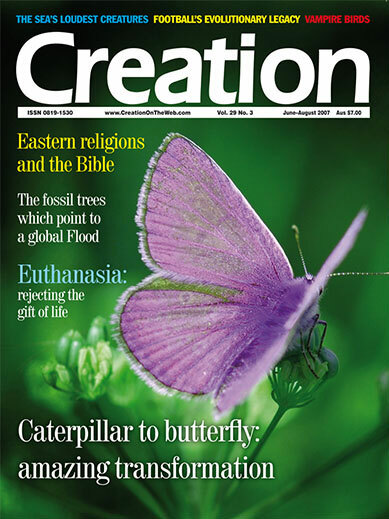 ‘Why doesn’t Sir David Attenborough give credit to God?’ at <www.creation.com/attenborough>. Return to text. Cf. vampire bats. See Woodmorappe, J., The dracula connection to a young Earth, Creation 21(1):32, 1998; <www.creation.com/dracula>. Return to text. That is, the descendants of those that came off the Ark. Return to text. 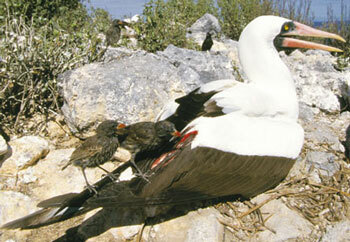 God did not create the various finch species in the Galápagos Islands during Creation Week, as some people (mainly long-age compromisers) have erroneously suggested in the past. (a) The world’s pre-Flood geography would have been radically different from today’s post-Flood topography. (b) Today’s ‘species’ (an artificial human construct) are descended from the original biblical ‘kinds’. The speciation evident in the finches and other creatures that have migrated to the Galápagos since the Flood is not evidence of evolution—see Wieland, C., Darwin’s Eden, Creation 27(3):10–15, 2005; <www.creation.com/darwin_eden>. Return to text. Wieland, C., Darwin’s finches—evidence supporting rapid post-Flood adaptation, Creation 14(3):22–23, 1992; <www.creation.com/finches>. Return to text.